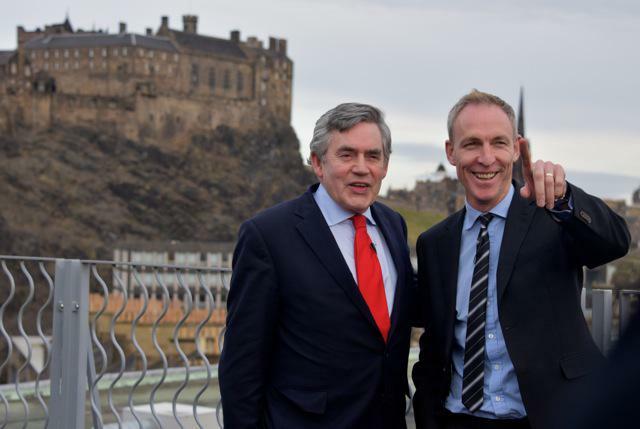 Former Prime Minister Gordon Brown MP spoke in Edinburgh yesterday about Scottish Labour’s plans for the new Scotland Bill, and why Labour’s plans offer the best outcome for Scotland. It’s a great privilege to speak alongside our new Labour leader in Scotland, Jim Murphy. Jim is not only an MP who has shown how we can win, having held what was a marginal seat in Eastwood, but whose energy and determination since becoming leader has shown he can take not just Scotland by storm but, as we saw a few days ago, can take London by storm too. I have no doubt that he will not only make a great Scottish Labour leader, but a great Scottish Labour First Minister. And I am pleased to have the chance to reflect for the first time in some months on the referendum, the Smith Commission and now the government’s draft laws arising from the Vow. Later this week, on Wednesday, I will be saying something about the issue of “English votes for English laws” (EVEL) in a debate in the House of Commons. I will put a clear alternative to EVEL, challenge the Conservative thinking behind it and make the case for full Scottish representation in the UK. But today I want to talk about the new Scotland Bill and, after my conversations with Jim Murphy, make my small contribution to Labour’s Scottish manifesto. Let me start from my experience of being an MP since 1983. Two issues have dominated debate in Scotland for the third of a century that I have been a Member of Parliament: unemployment and poverty. From the very first day I was an MP, I was engaged in a fight against unemployment in the coalmines, textile factories, engineering works and electronics plants. And from anger at the closures in steel at Ravenscraig to the campaigns to save shipbuilding on the Clyde, the whole of Scotland demanded new jobs and an end to youth unemployment. The first woman constituent who ever came to ask me to take up her case was protesting about the poverty wages she earned. And whether it was anger at the poll tax or more recently at the bedroom tax, Scots have repeatedly demanded action not just to create jobs but to deliver a fairer Scotland. It is why we find it so sad that the numbers using food banks in the last two years have quadrupled and why we find it unacceptable that so many have had to depend on payday lenders. It is the demand for full employment and the desire for social justice that inspired the creation of the Labour Party and made it such a powerful force in Scotland for more than a century. It is these causes that continue to inspire people to work for it to this day. So in the wake of the referendum, I have spent some months looking at how we could build on and flesh out the Vow we had made for a stronger Scottish Parliament that could do more to deliver employment and social justice. I have also examined what policies can make for a more employment friendly and fairer Scotland. In last four months, I have consulted experts on economic and social policy round the world, examined the experience of federal and devolved regimes, met for example the Premier of Québec who has been himself been putting the case for a new federalism, and examined carefully where powers can be devolved in a more radical way while upholding our principle that we pool and share resources to help support and come to the aid of each other across the United Kingdom. And so already with our Scottish leader Jim Murphy and others, I demanded what became paragraph 54 of the Smith Commission Report – that the Scottish Parliament should have the final say over benefit levels in Scotland. Jim, myself and others demanded too that to create a more just society, Scotland must also not just have the power to help the poorest family in the country but also have the power to tax the richest man in the country. And we all argued for the Scottish Parliament having a clear power over the Work Programme with an employment fund – and like Jim Murphy I want it now – to help end youth unemployment, to help mothers back into work, to create new jobs in the new technologies and to train people for them, providing financial help wherever necessary. But today we are going further. Jim and I are suggesting in far more extensive detail than before what the Scottish Labour manifesto will be and what the new Scottish Parliament will look like under Labour’s election manifesto commitment for further devolution within the UK – detail that builds on The Vow that was published four months ago. All of us want change. Of course if the Scottish people want straight out independence and to break all links with the UK, including for pensions, then they will support the nationalist position. But if, as I believe, people want answers to and better policies for tackling the most challenging problems we face – the creation of new jobs and material progress on social justice – then as I will show, Scottish Labour with its agenda for new employment and social justice powers for the Scottish Parliament, that we are setting out today, is better placed to deliver this change than the SNP. The Vow was a landmark in decades of devolution debate. It represented the overwhelming desire for change expressed by the Scottish people. It encapsulated our demand for a stronger Scottish Parliament. It showed a determination that Scotland should move forward in a new way and with faster, safer and – we believed – fairer change than proposed by the SNP. It showed that the choice in the referendum was not between the status quo and independence but between two visions of Scotland’s future: change within the UK as against change by leaving it. Agreement on further powers for Scotland was reached by St Andrew’s Day as promised. The draft laws were published by Burns’ Night as promised. And the plan to legislate this year, 2015, will be delivered as promised. The determination that the Parliament will have new powers, faster than any independence negotiations could have been conducted, has been achieved as promised. Now it is time to show how the details of the Vow can be best delivered by a Labour government after the general election. And it is time to put radical proposals which flow from the Vow on the table. The Vow was a starting point not the end point. And we are ready now, ten days after the coalition’s own proposals were published, to publish Labour’s own detailed proposals that arise from the work of the Smith Commission. Ours are more radical proposals than the coalition. For having studied the coalition’s statements and their draft laws, we can now show how we will implement the Vow in a fairer and more radical way that advances social justice in Scotland. And so we are breaking with the Conservatives and Liberal Democrats whose weaker version does not go far enough and we are putting forward the stronger version. It is in fact the Vow Plus further radical change. And so our first commitment is to give the Scottish Parliament the power to top up, amend or vary social security benefits. Let’s be clear: under Labour, if the Scottish Parliament wishes to reallocate money to tackling poverty or is prepared to raise it then the Scottish Parliament can vary benefit levels for families, the elderly, the unemployed and the low-paid in Scotland. While we will continue the pooling and sharing of resources for welfare – and I will explain how – we will also be able to top up benefit levels in Scotland. We are doing so by the detailed implementation of paragraph 54 of the Smith Commission Report, which says that the Scottish Parliament “will have new powers to make discretionary payments in any area of welfare without the need to obtain prior permission [of the UK Government].” Building on the work we have done in recent weeks ours will be a fall back but fail safe mechanism that gives the Scottish Parliament if it chooses to do so the final say. Jim and I have examined the Coalition’s draft laws and we believe that the welfare powers need revised. Indeed I am sorry that the Coalition policies do not spell out what we spell out now: that this will mean the power to add to pensions, to child benefits, to disablement benefits – in fact, to any benefit still administered by the UK Government in Scotland, and thus even to unemployment benefits. It is not clear what they mean by “on an individual basis” and it is almost as if they are repeating the Social Work (Scotland) Act 1968 which legislated for individual payments where there was distress and a need. Maintaining the system of pooling and sharing of risks and resources. Our new policy – the Vow Plus – is a fall back provision which allows us to take action if a UK government imposes measures like the bedroom tax. The Vow Plus is an insurance policy against the Conservative government today and any attempt in the future to impose benefit decisions that don’t accord with Scottish needs and conditions. The Vow Plus is a guarantee that in the final analysis the last word on benefit changes can rest with the Scottish people. And implementing the Vow Plus is in my view a better way of delivering the social justice agenda of the Scottish Parliament than breaking away from our UK pensions – worth £500 million extra to Scotland – and our UK-wide system of help for the unemployed and families for which the risks are shared across the UK and from which we also benefit. Scottish child benefits, unemployment benefits and pensioner benefits would start from the social and economic rights guaranteed by the UK welfare state, and we would start from UK benefit decisions about rates and eligibility. That would be the base line, but if the Scottish Parliament wished to do so and was prepared to pay for it the Parliament would be able to top up rates it found did not accord with Scottish needs or Scottish conditions. I personally prefer this top up power, this power of amendment, to a wholesale devolution of welfare which others argue for and which would bring an end to a century of pooling and sharing risks and resources to help the unemployed, the sick, the disabled and the vulnerable. It means that as before the costs of pensions and benefits are shared, the risks pooled, and a basic equality in rights and provision guaranteed no matter where you are across the UK, but if we feel that the needs and conditions of Scotland merit it we can vary the final amounts. To repeat: the Scottish Parliament will have a fail-safe provision to prevent the excesses of Thatcherite benefit cuts. It is a reserve power to defend Scottish people where that is thought necessary. It is an insurance policy to uphold the original principles of the welfare state. It gives the Scottish Parliament the final say in what level of poverty it will tolerate. As I suggest, this is a new and unprecedented power that can be used imaginatively. And this is backed up by the power to set the top rate and lower rates of tax to ensure greater fairness. With the power to set benefits and tax rates, it can no longer be said by anyone that the Scottish Parliament is powerless to address social justice. No longer can we blame someone else if we fail to act. And so our ambitions are nothing less than to reduce the need for food banks, to chase exploitive payday lenders out of Scotland and to end the evil of child and pensioner poverty in our country. But we will go further. Our second proposal goes further than the Smith Commission and represents the next stage in implementing our stronger version of the Vow. We will extend the devolution of benefits to include the £1.8 billion spent on housing benefit to allow us to do what is necessary to integrate our approach to housing – to benefits, to house building and improvement, to the rented sector – and deal with a housing crisis that the Scottish Government are ignoring. It is good news today that 64 per cent of households are living in owner occupied homes in Scotland, compared with 25 per cent in 1961. But what makes life difficult for lower and middle income families is that the average house price has continued to increase – from £73,000 at the turn of the century to £179,000 ten years on, pricing many out of the market. We find that Scottish house building has fallen 22 per cent since 2008 and that only 10,000 private homes were built in 2012, and only 5,000 housing association homes – despite the fact that Glasgow, Dumfries and Galloway, Inverclyde and the Borders have led the way in transferring their tenancies to housing associations. And we find that from the 26 of 32 councils who retain housing functions came only 1,000 homes. It is a scandal that 180,000 are on housing waiting lists and there is a shortage of new council and housing association properties. And while councils like mine are proposing to build nearly 1,000 homes themselves, these Scottish-wide rates of new building mean that it could take 60 years to house the 180,000 on waiting lists. As a result the private rented sector now houses far more of those in desperate housing need – 368,000 households and, where once the private rented sector was monopolised by single people, now 44 per cent of private sector rented households are families with children. In total 25 per cent of Scotland’s single parents live in the private sector. And yet the costs of private rented housing has grown so much – with the average Edinburgh private tenant up to 70 per cent of income and the average private sector rent at £537 per month. The cost is over £1,000 a year more than in 2010, meaning that it is not surprising that housing benefit claims have increased from 600,000 to nearly 900,000. 36 per cent of people in private housing are in poverty and, in a manner reminiscent of Victorian times before the building of public sector housing, there will soon be as many poor households in the smaller private rented sector as in the larger social housing sector. So we urgently need a policy today for private sector housing that gives people more stability, security and flexibility with fairer rents but also a long-term policy for building more homes. And instead of a policy for housing benefit going in one direction and a policy for housing going in another, we need the integration and coordination of the two. Glasgow is considering following Manchester in using pension funds for new building, not least because 298,000 homes in Scotland are affected by dampness and 62 per cent of social housing is below the quality standards. When new opportunities lie in the City Deal signed by Glasgow Council alongside west of Scotland councils, one answer that will help mobilise institutional investors for new housing, it makes it more important that the building and renting of homes and the payment of housing benefits are better coordinated – something which the devolution of housing benefit can make happen. So while the Coalition proposes a say for the Scottish Parliament in the rates of housing benefit, Jim Murphy and Scottish Labour are proposing the devolution of the whole of housing benefit outside universal credit. It will immediately raise the social spending of the Scottish parliament by 70 per cent from £2.5 billion to £4.3 billion, and its main impact will be that we can coordinate a fresh approach to solving the new crisis in Scottish housing so far neglected by the Scottish government. The third proposal which Jim and I have considered and accepted in what I call the Vow Plus, is to extend the power to make decisions to help the unemployed and ways we create employment. I feel passionate about the need for change when I see 30,000 teenage men and women – aged 16 to 19 – who have no jobs and are not in school or college or in any training. This lost and forgotten 30,000 represents a population comparable to a town the size of Motherwell. The new deal, from 1997 to 2010, ensured that 250,000 Scottish young people training or work that they otherwise would not have had, paid for by the utilities windfall tax introduced by Labour which generated £5.2 billion. However, after the global recession we needed a new initiative to get young people to work. In the past five years this issue of most importance to Scotland’s future – good jobs for young people, creating world-class local colleges that are vital for our long-term economic needs, and expanding opportunity for all – has been left neglected by the Scottish Government. So the newly empowered Parliament gives us a fresh chance to deliver what I will call “a new contract” with young people – one that both uses the new powers of the Scottish Parliament to create jobs and at the same time draws on the resources of the UK. The Scottish Parliament will assume all powers for the support of the unemployed people, taking over the employment programmes currently contracted by DWP. This includes a responsibility for the opportunities delivered mainly, but not exclusively, through the Work Programme and Work Choice, with a combined budget of around £500 million. The Scottish Government will therefore direct how programmes are accessed and who accesses them. They will able to tailor programmes to suit local geographic needs for all on Job Seekers Allowance or ESA referred on to the Work Programme from their local Job Centre Plus. We will build on the £500 million employment funds devolved to Scotland – which we want devolved immediately to the Parliament, so we can help the unemployed back to work. This, along with our powers of top-up, means we can change the financial help available including the incentives to work if we wish to do so, tailoring them to Scottish conditions and enabling a faster return to full employment. No one can say the devolution of all employment policy, for training and with fall-back powers on incentives and sanctions for benefits, does not allow Scotland to shape the future of employment. This, along with our powers of top-up, means we can change the financial help available, including the incentives to work if we wish to do so, tailoring them to Scottish conditions and enabling a faster return to full employment. And with this added power giving us discretion on benefits, we can if we chose adjust unemployment benefits to meet the conditions and needs of Scottish citizens and the needs of creating jobs. The wholesale devolution of the Work Programme allows a new laser like focus on helping the unemployed into work and gives us ability to search out and even create new opportunities for the young school-leaver. The fourth measure of the Vow Plus is what Jim Murphy will highlight – the need to devolve power within Scotland. At its best, devolution is about partnership between different levels of government and the local communities they serve. The purpose of devolution was never to devolve power to a Scottish Parliament, only to see it accumulate powers from the local level upwards. The issue of devolution has too often been approached through the prism of devolving powers from the UK Parliament to the Scottish Parliament – rather than considering the opportunities for further devolution of powers to local government, communities and people, as Glasgow has done successfully with its Clyde Valley counterparts in forging a new City Deal. Labour has committed to devolving Skills Development Scotland’s responsibilities to local authorities. But I know Jim Murphy believes that we can go further. With all these powers and with the power to tax, we can give additional help to the poorest – helping improve social justice but doing so by building the common rights each citizen has from the UK wide system of pooling and sharing of risks and resources. The changes we propose mean that from 2016, Scotland will enjoy more autonomous spending power than the states in most federal regimes. It will start with the ability to spend £35 billion (including housing benefit) a year, which amounts to nearly £7,000 for every Scot. As such, under Scottish Labour the spending power of the Scottish Parliament will exceed that of American states in what is the highly decentralised US, and will be far greater than that of the highly autonomous Lander in the German federal regime. Under Scottish Labour, the Scottish Parliament’s spending power will also surpass that of the devolved assemblies in Spain and Belgium, despite the widespread transfers of power from the centre these countries have seen in the last decade. The Scottish Parliament will not only have more spending power but will also have more taxing power: it is planned to receive 62 per cent of its income from either its own decisions on tax or assigned revenues. No one can say the Scottish Parliament does not have the powers to act on social justice and the issue is not what powers the Parliament doesn’t have – which is still the debate the SNP want in Scotland – but what powers it has and how it uses them. We want a 21st century version of devolution for an interdependent world with clear powers to address the concerns of unemployment and social injustice. And we show the unique approach Labour has. While the Conservatives would deprive us of some of the powers we know we need to tackle injustice and unemployment, we wiill ensure the Parliament has them. And while the SNP want independence – incidentally without leaving the UK currency and framework for macroeconomic management – their proposals would mean that with falling oil revenues Scots would have to pay billions more. It is a Labour vote that will deliver change without the risks the SNP and Conservative policies bring. And when we promised faster change we meant it: we are committed to implementing the changes with a new Scotland Act within just over three months days of gaining power. With the Vow delivered and with the Vow built upon with a new radical approach we can achieve our historic aim – full employment and social justice for the people of Scotland, the real purpose of the Labour Party. Of course if the Scottish people want full blown independence then they will reject our proposals in favour of the nationalists. But my reading of Scottish opinion is that people want change and that the biggest issues that motivate the desire for change are not constitutional, but social and economic. People want better polices to deliver jobs and social justice and with Scottish Labour setting out its new agenda for new powers in the Scottish Parliament for employment and welfare, our policy of change without risks is better placed to meet our country’s needs than independence.